The term "rescue" is often construed as the happy ending, the final step to a better life for a suffering animal. At PAWS, "rescue" is just the beginning of a long, dedicated endeavor to provide the best quality of life for victims of captivity who are physically and psychologically damaged - requiring round-the-clock monitoring and specialized care often for the remainder of their lives. On arrival at the PAWS sanctuary, each animal is evaluated carefully for necessary treatment, diet and housing, and progress reports are recorded in daily logs. Although captive enclosures can never substitute for wild habitat, all sanctuary enclosures are designed to provide grass, trees and an enriched environment for individual animals with consideration for any health or psychological complications, which might preclude their ability to engage in normal activities. Enclosures for healthy animals are designed to replicate, as closely as possible, wild habitats for that species; specially designed areas are constructed for older, arthritic or injured individuals. PAWS has maintained its animal sanctuaries without problems or incidents and has earned an excellent reputation and the greatest respect from neighbors and the local communities. PAWS ARK 2000, 2,300 acres in San Andreas, CA, is currently home to African and Asian elephants, tigers, bears, African lion and a black leopard. The elephant habitats at ARK 2000 provide the elephants with acres of varied natural terrain to roam, lakes to bathe in, and state-of-the-art elephant barns equipped with heated stalls and and indoor therapeutic pool. PAWS rescues abused, neglected, retired and needy captive wildlife through intervention and legislation designed to stop the problem by prohibiting indiscriminate breeding of exotic animals for the pet industry and the use of wild animals in entertainment. 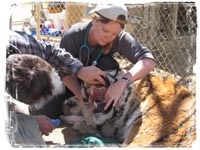 In 2004 PAWS ARK 2000 became the home for 39 tigers rescued from a deplorable breeding facility in Southern California. The tigers, who had lived on a landfill, now enjoy their own free-range refuge among the trees, hillside and lakes of ARK 2000. At PAWS sanctuaries, rescued animals live in peaceful and natural habitats, free from fear, chains, and harsh confinement. They are at complete liberty to act out natural behaviors in the comfort of their individually designed enclosures. PAWS animals are not bred, traded, sold, rented or forced to perform in any way. PAWS educates the entertainment industry, public officials and the general public in humane care and treatment of captive wildlife. Through our public awareness campaigns, more and more concerned individuals are becoming aware of the problems inherent with breeding of wildlife in captivity and the use of animals in entertainment. PAWS animals are cared for by a team of more than 30 knowledgeable, well trained, and compassionate keepers, wildlife specialists, and veterinarians, who together provide 24/7 care. PAWS takes pride in an excellent track record of animal health maintenance, disease prevention, behavior enrichment and constant monitoring of all of the animals - promoting the best quality of life for victims of captivity.